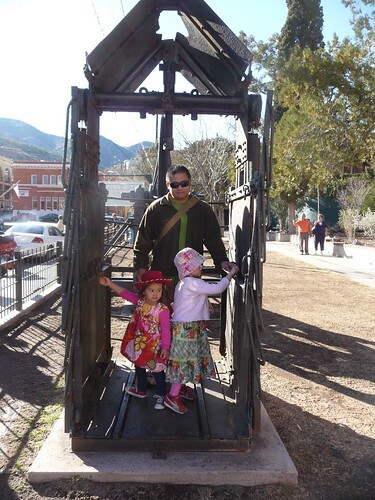 Mali Mish – Day 13: Old Town Bisbee, Arizona. 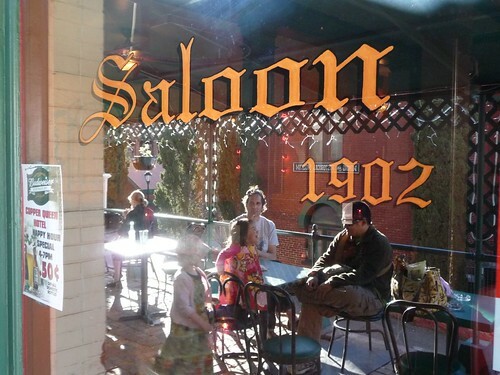 Day 13: Old Town Bisbee, Arizona. We decided last night that today was going to be our last full day in Bisbee. We wanted to get out and start seeing some sights. As good as relaxing at The Shady Dell sounds to us, if we didn’t get our act together on this road trip, we could veg out here forever. So the plan is to soak up all that we can today in Bisbee and head out into New Mexico tomorrow. 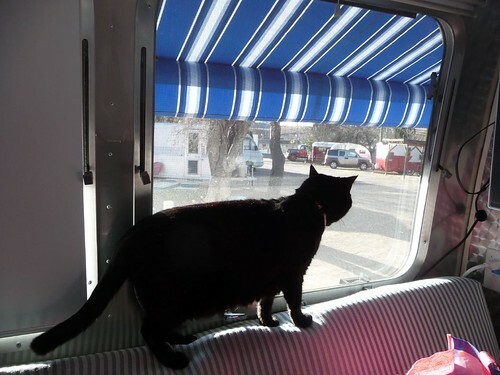 I think Yoda overheard our conversation and decided if she is going to stalk Bisbee birds, this is going to be her last chance. 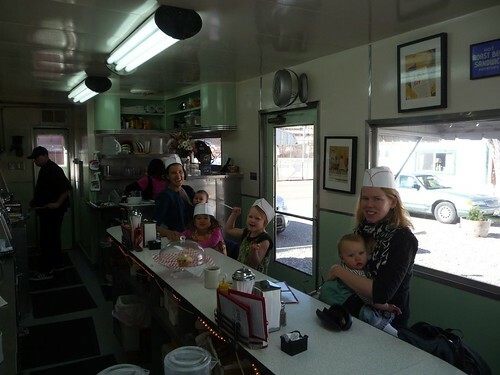 Marlene and the girls got one last chance to have breakfast at Dot’s Diner. 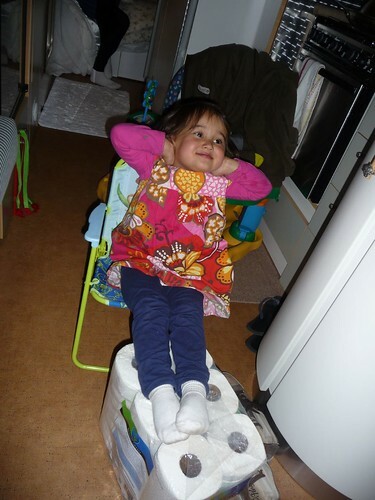 Ava’s new friend Sophia and her family also joined them. 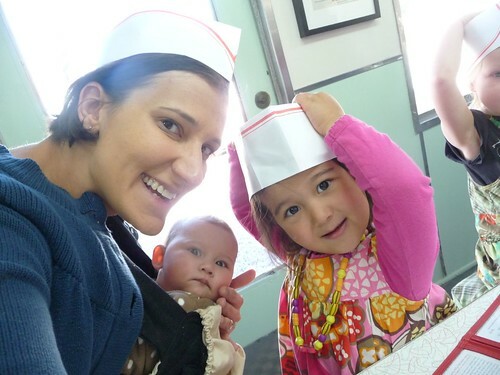 Check out the sweet hats they got from the waitress. 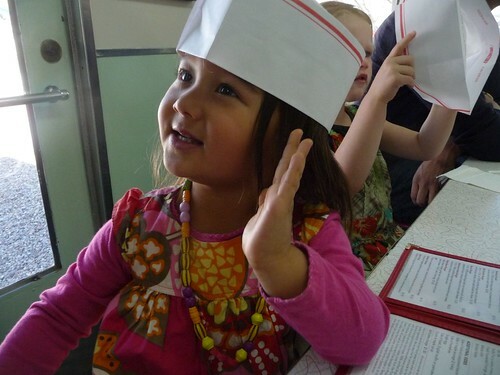 Dot’s Diner is a tiny little place and is only open for breakfast and lunch Friday through Wednesday. This is probably the most people they have ever had in there on a late Wednesday morning. 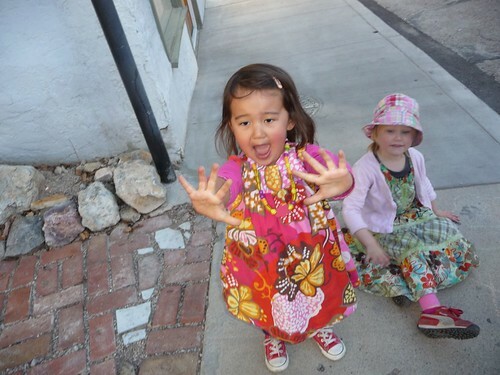 We finally got our act together in the afternoon and headed into old town Bisbee. 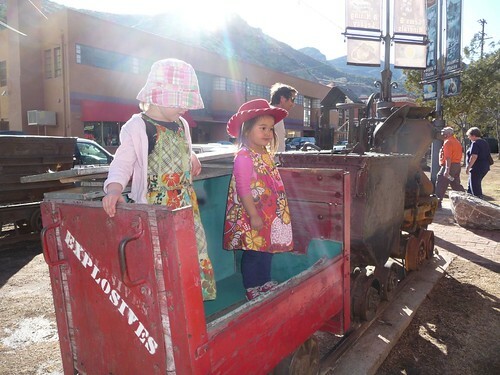 The girls loved playing at the mine carts in front of the local museum. Every time we come here, we always come by the museum. But at some point in the last few years, they had raised their entry fees from $4 to $8. For some reason, the extra $4 just didn’t sit well for me and we have always decided against checking the place out. Maybe next time. Hopefully they don’t starting charging the kids to play on these old explosive-carrying mine carts. 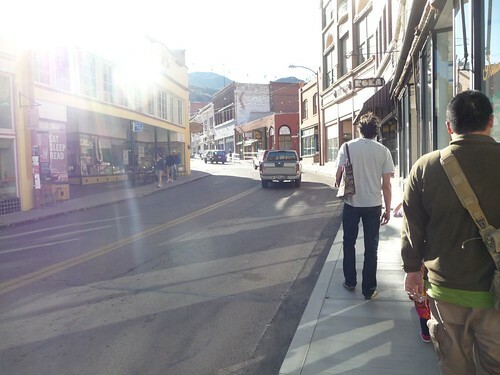 A mid-week stroll down the main drag at Bisbee is a pretty quiet affair. The town seems to have been effected by the recession as many of the stores have either closed down or is on the verge of shutting its doors. 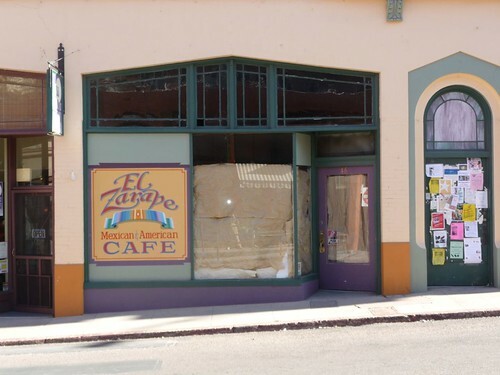 The El Zarape Mexican and American Cafe also seems to be closed down now. We were just here a little over a year ago and had a great meal there. It’s sad to see places like that go away and it would certainly be a shame to see Bisbee be another casualty in this economic downturn. Maybe I should, after all, do my part and splurge the extra four bucks for the museum just so they don’t also go out of business. 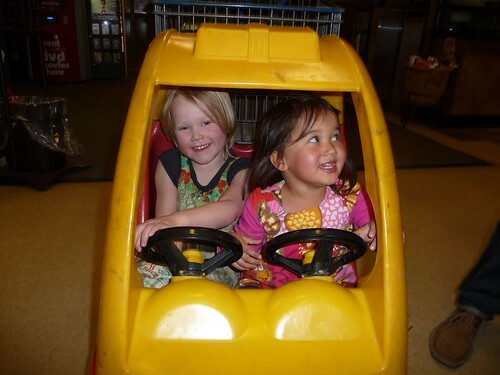 Ava and Sophia seem to have really hit a stride in their new friendship in these few days. 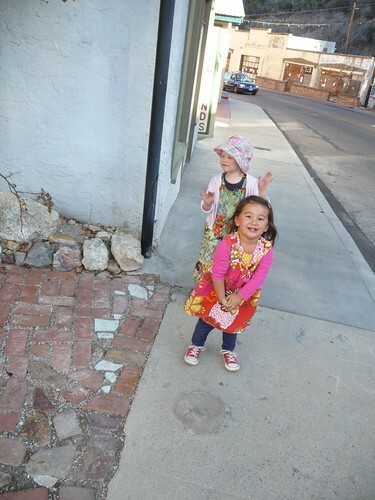 On our walk in Bisbee, the rowdy pair played a little game I call ‘Toddler Checkpoint’ with us. Once we all stopped, we had to sit on the sidewalk so Sophia can toss out a riddle for us before we are allowed to cross. 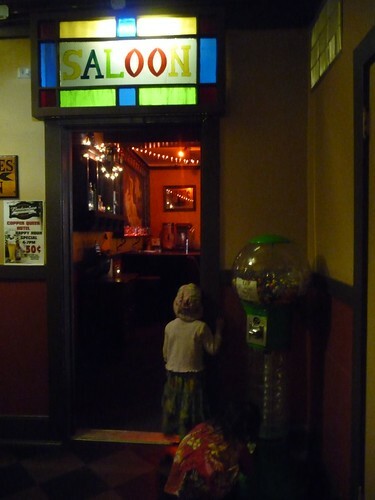 Luckily we got the right answers because we were sure thirsty for a cold drink at the Saloon in Copper Queen Hotel. Just in time for Happy Hour I thought as I see the sign on the window offering 50 cent beers. But it turns out too good to be true. The small print below disclaims that its only 50 cents ‘off’ of a domestic beer. So be it, I will take whatever discount I can get for a beer. We wrapped up yet another nice day at Bisbee with a meal at Pizzarama Gus the Greek down the road from The Shady Dell. The girls got to ride in the shopping cart taxi cab as we stocked up on some supplies at the grocery store before we head out tomorrow morning on the road. Stay tuned for New Mexico!!! 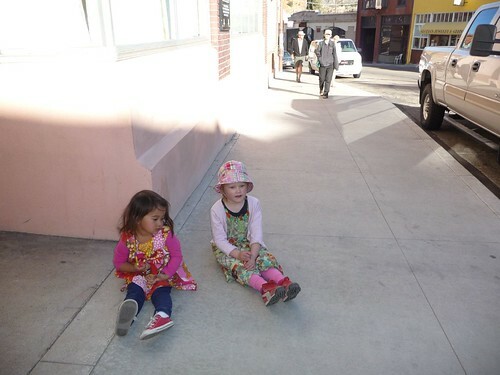 One Response to Day 13: Old Town Bisbee, Arizona. Looking forward to your adventures in New Mexico!